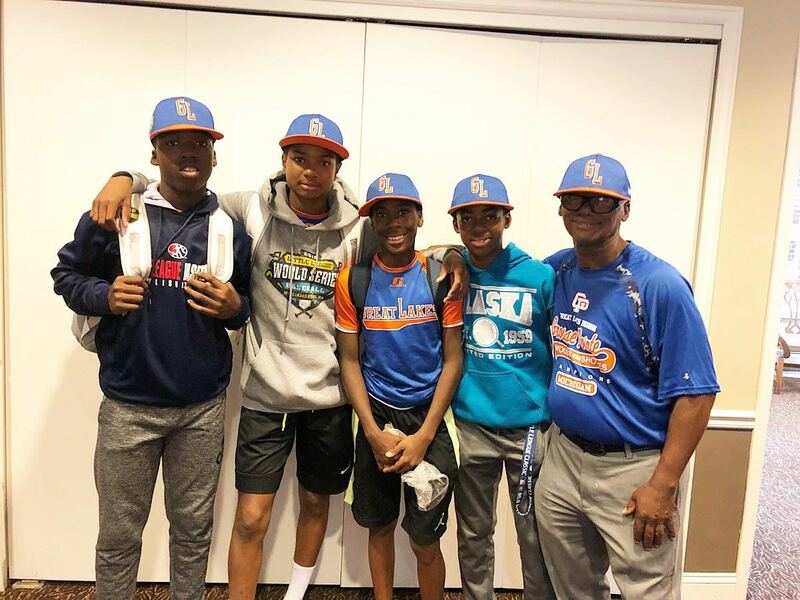 Grosse Pointe Woods-Shores baseball players Oliver Service, Jarren Purify, Marwynn Matthews Jr., Reggie Sharpe Jr., and assistant coach Reggie Sharpe Sr.
By the numbers, baseball is indeed a white man’s sport. At the game’s highest level, Major League Baseball is only composed of 7.8 percent African-American athletes, with 58 percent of all players being white. The representation of black players in college is low as well, at less than five percent. At the sport’s lowest level, much is the same. At this year’s Little League World Series (LLWS) in South Williamsport, Pennsylvania, majority of the teams were predominantly white, including the Grosse Pointe Woods-Shores team that represented Michigan. Of their 13 players, only four were black: Oliver Service (13), Jarren Purify (12), Reggie Sharpe Jr. (12), and Marwynn Matthews Jr. (13). People may question why the racial makeup of a team that won more games at the Little League World Series than any other team from Michigan since the 1959 Hamtramck world champions would matter. But race absolutely matters when it comes to grassroots baseball in America. The Grosse Pointe Woods-Shores little league baseball was team was greeted by the Grosse Pointe community after losing in the Little League World Series. Even the kids noticed the discrepancy between them and everyone else at the Little League World Series. In the previous years, predominately black teams such as the 2018 Mamie Johnson Little League team from Washington D.C., the 2014 Jackie Robinson team from Chicago that won the LLWS U.S. Championship, and Mo’ne Davis’ Philadelphia’s Taney Youth Baseball Association team in 2014 were all praised nationally for their baseball exploits. Why? In communities where those programs are from, Southside Chicago, South Philadelphia, and parts of the nation’s capital, baseball is not a prominent sport for a complex number of reasons: the lack of refunds, exposure and opportunity, sport specialization, the cost to play, and lingering racial stereotypes about race and baseball. With the decline of baseball participation around the country over the years, youth leagues and teams have been forced to shut down or merge and travel teams have become more popular, which restricts access for poorer youths, making the sport whiter and more affluent. The players of color on the Grosse Pointe team were fortunate enough to have been exposed to baseball at an early age, in one of the more affluent communities in Michigan, which is a direct result of their success to this point. Service began playing at an early age, Sharpe’s dad bought him a Wiffle Ball set when he was younger, Purify’s mother got him started at age two with a tee-ball set, and Matthews Jr. has been playing baseball since he was six. Members of the Grosse Pointe Woods-Shores Little League World Series team. Sharpe is the lead-off hitter for the team, Purify is the star at third base, Service is the power-hitter in left field, and Matthews is the utility guy who doubles as a jokester. The foursome has been playing baseball together for a few years and have built a bond that only grew stronger during their historic LLWS run. The Reviving Baseball in Inner Cities (R.B.I.) program was created in 1989 to reintroduce baseball in urban areas and has been operated by MLB since 1991. This program is in place in more than 200 cities worldwide and had 250,000 participants this year. The first Urban Youth Academy in the U.S. was started in Compton, California, in 2006 and has spread to many cities. Each complex typically has two full fields, a softball field and a youth field, and drew almost 40,000 participants last year. In Detroit, the Police Athletic League (P.A.L.) has baseball for all ages. Their baseball games and programs are held at the old Tiger Stadium location, now called the Corner Ballpark. In 2015, P.A.L. launched the Kids at the Corner Campaign to raise $20 million towards the redevelopment of the site. The field is named the Willie Horton Field of Dreams and aims to give the next generation of kids in Detroit an opportunity and place to play baseball.